Trevose, PA – The new Lenox VideoFlex Turbo series is an easy-to-use, battery-powered, remote imaging system featuring 4-way tip articulation and an integrated control / display hand piece with a 3.5-inch LCD display. This portable, VideoFlex Turbo series videoscope is well-suited for inspection of aircraft engines and turbines, airframes, manufacturing, process tanks and vessels, tubing and pipes, and heat exchangers. It can also be utilized in covert surveillance, explosive ordinance disposal (EOD) and armament applications. 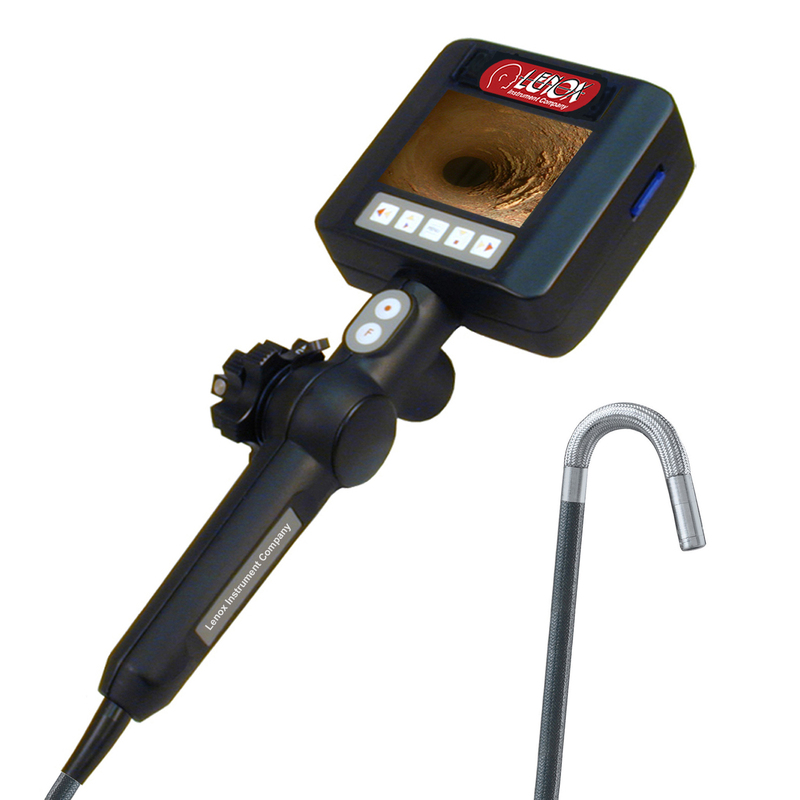 For efficient viewing inside complex assemblies, the high-resolution, Lenox VideoFlex Turbo videoscope features integrated LED lighting, a tight bending radius, and a totally steerable 4-way, 150° articulated tip that allows easy manipulation around corners, through pipe bends and past blockages. The working portion of the scope is protected with impregnated tungsten braiding and available in diameters of 5.0 mm (.197 in. ), 6.0 mm (.236 in.) or 8.4 mm (.330 in. ), with lengths to 6.0 m (19.7 feet). The VideoFlex Turbo videoscope hand-piece is ergonomically designed to facilitate easy articulation of the scope tip during inspection with keypad control for image and video recording and video adjustments and playback. Menu functions enable adding text to images and JPEG and MPEG4 image/video recording onto a SD card. Interface connections for SD card, auxiliary video output and fast charger input are provided. Each Lenox VideoFlex Turbo series scope is furnished with a 90 - 250 volt, 50 - 60 Hz power supply/fast charger, 2GB SD card, and a rugged carrying case. An optional right angle mirror head (8.4mm probe only) and centering devices for 6 and 8.4mm probes are available. Each Lenox VideoFlex Turbo series videoscope is designed, manufactured and serviced in-house by Lenox Instrument Company, and is backed by an industry-leading two-year warranty.